This impressive and important 28-story, orange-brick building was erected in 1941 and has 321 rental apartments. It was designed by Mayer & Whittlesley, an architectural firm that also designed the same year the 22-story apartment building at 40 Central Park South that has a similar but even more striking roof. The same architects were also co-designers with M. Milton Glass of 220 Central Park West in 1954. 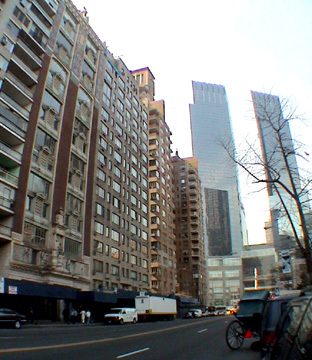 All three buildings extend through the block to 58th Street. 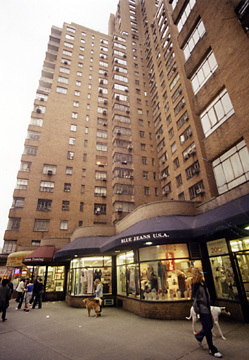 According to Robert A. M. Stern, Thomas Mellins and David Fishman, in their superb book, "New York 1960 Architecture and Urbanism Between The Second World War And The Bicentennial," (The Monacelli Press, 1995), this building was "the first Manhattan apartment house to make extensive use of balconies." The authors noted that this building replaced the "Dalhousie (1884), a pioneering apartment house." 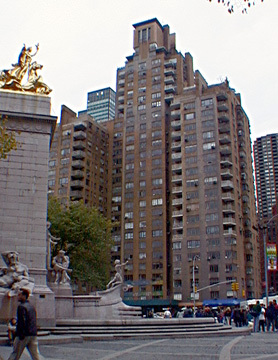 "The era's last example of the courtyard apartment house was 240 Central Park South. Despite the limitations of the courtyard, the contextually responsible design was a superb restatement in Modernist terms of the River House parti. [It] occupied a complex point of transition in the city, fronting Central Park South, Columbus Circle, the diagonal of Broadway, and West Fifty-eighth Street, each of which had its own distinct character ranging from one that can be likened to the Champs Elysées at the Etoile to another resembling a quiet backwater at the edge of a big city. It was not its bland facades that lent 240 Central Park South distinction but rather the shaping of its two towers, particularly the northern one, in response to the complex perimeter of the site. Aspects of the courtyard apartment building were combined with those of the skyscraper apartment building to establish both a horizontal and vertical reflection of the city's composition. Terraces began only above the level of the trees in Central Park (high enough to be free of the fumes from the street); roofs were set back not only to conform to zoning requirements but also in consideration of solar orientation and views; and chimneys and mechanical equipment combined with the penthouse suites to produce a lively skyline. At the street level the building respected the varied nature of its local: a deep, planted courtyard on Central Park South creates an elegant pocket of shade, while a vigorous one-story commercial strip along Broadway used curved corners to define the diagonal of the street. The building succeeded not as a tour de force of dazzling aesthetics but as an exemplar of humane values applied to the problem of high-density city living and as a finely tuned instrument of urbanism. Both a fragment of the city's fabric and a notably individual statement, it was a synthetic work that was at once infill and icon." Apartments facing north in this highly visible building have spectacular views, but seen from the west the south tower seems a somewhat ungainly afterthought and the one-story retail spaces that connect them along Broadway almost seem crushed by their weight and would have been more effective as if it were somewhat taller. While no match for the some of the limestone palatial apartment houses of Fifth Avenue or Emery Roth's great skyscraper apartment towers along Central Park West, 240 Central Park South is an interesting and good building at the end of the Art Deco period and its façade murals while not memorable are delightfully colorful. The building has stunning vistas of Central Park West to the north and, from its upper floors, midtown to the south. There is excellent local shopping - it is directly across Columbus Circle from the huge, twin-towered Time Warner Center that opened in early 2004 - and public transportation and it is only a few blocks south of the Lincoln Center for the Performing Arts. It has a concierge, many balconies, many corner windows and very colorful mosaic murals on the second and third floors above its courtyard, canopied entrance on Central Park South. It has sidewalk landscaping, but no health club and no garage. It has protruding air-conditioners and a very elegant Italian restaurant, San Domenico, just to the east of its entrance. 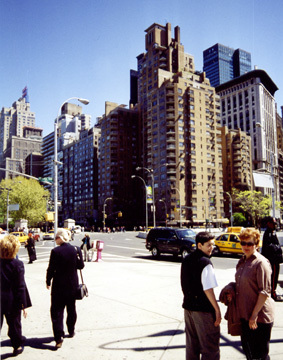 There is considerable traffic at this Columbus Circle location.